A good chair is a coveted item in the world of camping and river trips. Camp chairs aren’t “essential”, but when it’s time to sit around the fire, post up in the shade down by the river or sit back and read a good book, a chair is a fine luxury! So for our 4 day leisure pack-rafting trip down the lower Deschutes River, we brought four Leki Breeze chairs for our group of 16. Every afternoon when it was time to set up camp and sit back and drink a cold one, the chairs were in high demand, often resulting in some great entertainment in chair hoarding. On the first evening of the river trip, we set them up and wowed everyone with how easy and quick it was. I just held the center poles and twirled the bungee-corded sections around until – voila! A chair frame! Next I put the canvas cover on, attached the drink holder and the bag underneath the chair for a snack stash and took a seat. It was comfortable, stable, easy to set up and kept me off the ground. I was impressed. Over the course of the river trip, we put the chairs to the ultimate test. Every time we set them up or took them down we had races to see who could do it the fastest. Currently the record is 19 seconds for set up and 40 seconds for take down. We did acrobatics on it, tried to sit on it on the slackline (that tester didn’t fare so well, but the chair was ok), lifted each other up in it (think Jewish wedding) and simply sat in them while drinking cold beverages. In all of these tests, they didn’t break or show any signs of weak points. 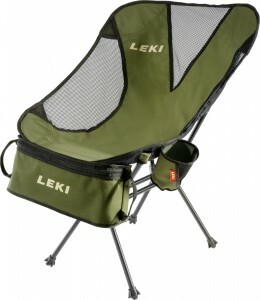 It looks and feels like Leki put as much thought into the chair as the brand does its poles. The poles that make up the frame are made out of the same high tensile strength aluminum tubing as trekking and alpine racing poles, making it a very strong and stable foundation. The actual canvas is deep and sling style, making it a very relaxing and comfortable seat for many types of bodies! Some of the bigger guys said that they felt like they were going to fall over in the sand. I heard a rumor that the chairs could come with wider “sand feet” that could help them not sink, but those are an add-on. The company should put sand feet in with every chair so they are ready for any terrain. This is not a seat for people who have trouble getting out of low chairs, as you sit low to the ground. 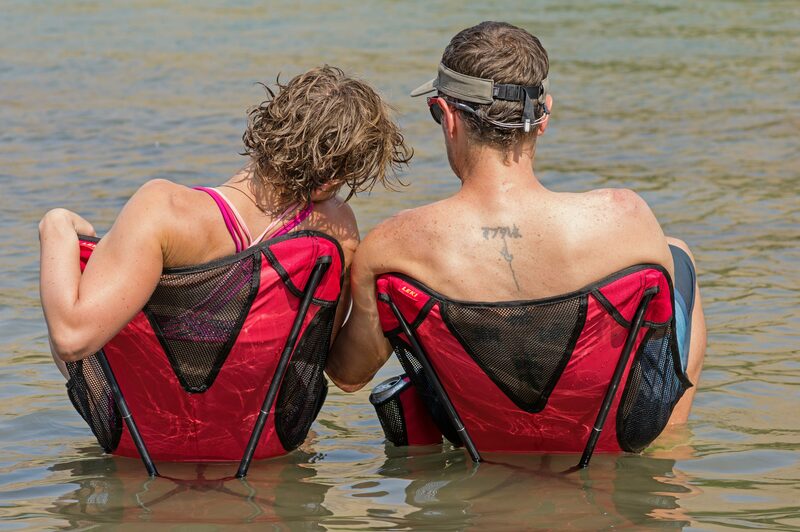 River trip, car camping, yard, soccer games… When do you not need a chair? We keep two in our car for emergency and two on our back deck for use everyday.